This is the second in what will hopefully become a series of reports where we explore Nova Scotia’s protected wilderness areas (the first was An Epic Wilderness Adventure in the Burbs). This is the first time Wade posted a trip plan in advance and a last minute update before we headed out. Check out those posts to read about the background and rationale for this trip. We’ll try to continue posting these updates just before we head out. That is where all the last minute magic happens. Briefly, this trip was about breaking out some new gear, and what better way to do that than in a new-to-us wilderness area. Gully Lake Wilderness Area provided the perfect opportunity to test new equipment and techniques in true winter conditions (as much as Nova Scotia has to offer). We’d been obsessed with the weather forecasts for weeks as we seemed to be getting a snow storm followed by a rain storm followed by deep freeze every week leading up to the trip. It looked very promising but this is Nova Scotia and it was always very possible that there might not be any snow left, or worse it could rain all weekend. We were a group of 7, and although we all knew each other and all had winter experience, we hadn’t all traveled together as a single group before. So what could possibly go wrong, right? The trip had almost been derailed when we learned that the trailhead parking lots were buried under snow. Luckily Wade thought to check in with the owners of nearby Sugar Moon Farm to see if they had any suggestions. They graciously offered us the use of their parking lot for the weekend (as well as dreams of all-you-can-eat pancakes and home-made maple syrup when we made it out!). It meant changing the planned route slightly, but not significantly. We’d still be in the wilderness area, just likely not quite as far in. We knew the sleds and sheer amount of snow were going to make this a pretty low-mileage trip. The plan was to drop off half of the group and all of the gear at the Earltown Lakes and Portage trailhead, drive 1 km up the road, and park the cars at Sugar Moon Farm. There was enough snow that it took us a few minutes to find the trailhead even though we knew roughly where it was located along the main road. Because we were uncertain of the terrain we had requested everyone pack their sleds with just backpacks and no loose gear so that we could easily change strategies if the terrain was not sled-friendly. It immediately became apparent that half of the group didn’t follow those instructions. They were unloading full backpacks to be worn in addition to a variety of “bungee corded refuse” (the precise term Wade told people to avoid) to be pulled in the sleds. It was at that moment we knew there would be no changing of strategies. We arrived at the Sugar Moon Farm parking lot around 2 pm and a closed sign was hanging in the door, argh… this was the last warm washroom and hot running water for a couple of days. We tried the door anyway and voila, home sweet home. Staff inside were getting ready for the weekend rush and welcomed us in anyway. A quick pit stop after changing into our weekend attire and we set out walking down to meet the rest of the group. This was definitely a snowshoe trip… We grabbed this one quick shot of the trailhead sign when we arrived back to meet up with the rest of the group. They had finished their preparations and were getting cold and anxious to start moving. In fact one group member had already hiked up the first hill to stay warm. Here we are setting out to catch up. The trail wound up through a beautiful open hardwood forest right from the first few steps off the road. We immediately realized poles without baskets weren’t going to be much help for anything more than prodding along the tired. That said, the baskets we forgot at home are pretty small and after this trip, we’ve added large powder baskets to the shopping list. Luckily, the sign posts were still poking out of the snow and the blazes on the trees were plenty high to be easily seen. Before we arrived we weren’t sure whether we would even be able to follow the trails because of all the snow, but it was no problem at all. We readjusted our sled and were moving at a nice steady pace until we got to Earltown Lake where the terrain changed. The ups and downs were steeper with tighter turns. It became challenging to keep the sleds upright and on track. It continued to get worse as we traveled along the south side of Taylors Lake. The trail ran along a steep hill and the sleds kept pulling to the side and downhill. We could have saved a ton of time and energy if we’d been able to don the packs and drag along empty sleds until we got back on level terrain but since not everyone had that option we muddled along with one person pulling the sled and the other walking alongside to keep it upright. For the next trip, Wade is going to make a retractable fin to help the sled track better on a side slope. Luckily it was only a few hundred feet and then the trail leveled out and widened. Snowmobiles had traveled through this area allowing us to pick up the pace. We wanted to find tent sites before dark and with dusk approaching and temperatures dropping there was some discussion of stopping in this area. We were able to keep the group going to get some distance between us and snowmobile trails, and picked the first suitable site we stumbled across. We were still officially along the Earltown connector, but were close to the Sandy Cope Trail and snowmobiles hadn’t traveled in this direction. The area was exposed but the forecast was calling for no wind or precipitation. We heard the odd snowmobile buzzing in the far distance but they were infrequent. We arrived in time to get mostly set up before dark. First task was to trample down the tent sites and try out the new snow stakes. It was an exercise in patience waiting the half hour for the stakes to set before tensioning the tent. While the stakes set it was time for supper of hot soup, cheese and rolls. It was a slow cold process sorting out sleeping bags and pads. We don’t have true winter bags, and had each brought two pads, two bags and a down quilt to cover the both of us. For future winter trips we’d like to have a single winter bag, an XTherm and a Z Lite Sol. Every extra piece of gear requires a little more time and effort, which turns into a lot more time and effort with cold fingers. It was -20ºC outside when we climbed into our tent around 9pm. We brought the thermometer inside and just a few minutes later once we got settled into our sleeping bags it was reading +1. It was definitely great to have a 4-season tent on this trip. The worst of the cold passed while we were sleeping, but even though it was still cold in the morning we could feel warmth from the sun by the time we got out of the tents. We took the opportunity to drape our sleeping bags and quilt over the tent to evaporate some of the frost that had formed from our breath overnight, and melted when we got up in the morning. Steam could be seen billowing off them in the sun. Our loose plan was a late start, maybe leaving sometime after 10:00 but we ended up leaving at 11:30. We’d already decided at this point that we weren’t in a rush and would focus on slow and steady…and warm. However it’s always a challenge to time departures perfectly and in a group this size, someone always ends up waiting. Very shortly after setting out we officially entered the wilderness area. It was another bright sunny day! We had our packs securely attached to the sled this time, though there were still some uneven parts on the trail that required a second set of hands. Wade had added a tagline to make it easier for the second person to keep control of the rear of the sled. The trails in this area are well mapped and the signage is great. There are quite a few maps available online from different sources which is great but a little confusing. 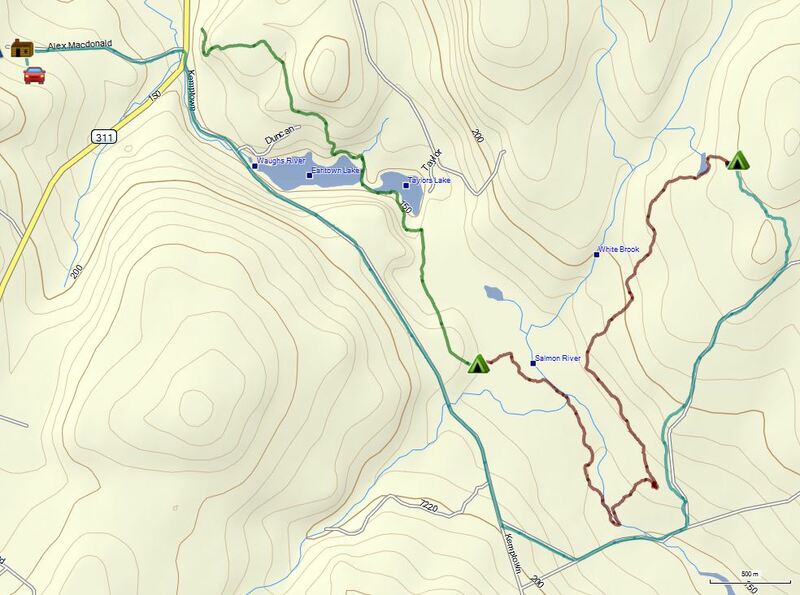 Not all of the trails in the area are on the maps and not all of the maps have the same trails, especially the ATV and snowmobile trails and fire roads. If you’re planning on traveling in this area, you may find it helpful to compare a couple of maps to find your route. Other than our tent site the night before, this was one of the few softwood stands we passed. The trail was pretty easy going in the morning. We only crossed a few bridges, and only one with hand rails. All the other “bridges” required a scout with trekking poles to determine whether it was in fact a solid bridge or just a snowdrift over water. In a few places without bridges the trail dipped low over streams that you could easily hop across in the summer, but the snow added feet to the height of the banks and we had to unfasten the sleds and pull/lift them across. Luckily there were no mishaps and we all stayed dry. We had told everyone to be prepared to get all our water from melting snow. In fact we only saw running water in 2 or 3 places, and even then it was not always easily accessible due to the amount of snow on the banks. This was the only spot anyone broke through with their snowshoes on. Aside from the odd downed tree that we had to duck under, the trails appeared to be in great shape, from what we could tell walking 3-4 feet above them. We had initially agreed upon a 1:00 lunch and planned to be campground shopping by 4:00ish. After lunch the trail switched from gentle rolling to a gradual but mostly steady up hill slog. Some of the group were getting tired around 2 pm and were ready to start looking for a campsite. This always ends up generating a lot of debate with a group, including whether it’s better/worse/safe/unsafe for the group to split up, but it also bought us a little more time to push on through sloping terrain which wasn’t suitable for tenting anyway. By the time we reached Sandy Cope Lake we had all agreed to stop at the next suitable campsite. It was about 20ºC warmer by the early afternoon. Shortly after this point, the temperature plummeted. We ended up finding just about the most perfect campsite shortly after passing Sandy Cope Lake, around 3:30 pm. This was a surreal campsite unlike anything we ever come across in NS. It was as flat as can be, without a softwood or shrub in sight. We can’t wait to see what it looks like in the summer. Below is Wade starting to trample down our tent site. Trying out the camera’s timer feature with a new tripod. There was lots of room for everyone to spread out between the trees. The tents were set up in time for everyone to meet up at our makeshift dining area in the daylight. Piles of packed snow worked great to support the upside-down sleds as benches. There was lots of discussion about camp clothing, water, stoves, hot water bottles, hand/feet/body ‘warmers’, sled and harness designs, and various other cold-weather strategies. We are going to need some better camp clothes for more trips like this one. These sustained low temperatures are unusual for Nova Scotia where most “winter” trips could be considered three-season in colder climates. Wade’s list now includes Forty Below Camp Booties and a down parka. Another great sunset, 2 nights in a row. By dusk we were getting cold and ready to retreat to our tents. In cold weather, tent time comes way before bed time! Lightweight games like miniature cards, dice, paper cribbage boards… have improved our summer backpacking immensely but the thought of having any extremities outside of the sleeping bag in frigid temperatures was unbearable. We’ve brought music along on trips before, but realized on this trip that an iPod shuffle with a good audio book would be great evening entertainment. It was warming slowly from the overnight low, but the thermometer still only read -20°C as we were packing up. Everyone was moving pretty fast in the cold weather, knowing that we were only a few hours away from pancakes! We set out ahead of schedule, walking right into beautiful snow-blown hardwood stands. With the exception of a few sets of cold feet, we had all handled the extreme cold pretty well. The temperature rose quickly after we started walking, and there were frequent stops to remove layers. Sunday morning started out easy and only got easier. We traveled downhill for the remainder of the Sandy Cope trail. We were moving pretty quick by this point… pancakes were a big pull. As a bonus the snowmobile trail we planned on taking was actually just an old woods road. It was a pleasant surprise that the trail hadn’t been used and was covered with beautiful fresh powder. With another downed tree, just for a bit of added challenge. We continued for a while until we hit the 104 snowmobile trail. Here the trail was groomed for snowmobiles and we were able to remove our snowshoes. It was much faster going in boots and it was only a short distance back to the main road. Although we mostly stuck to single file on the left hand side of the trail we were lucky to pass only 2 other snowshoers out for a day hike and no snowmobiles. The roads were beautifully plowed to a flat base layer of snow and it was easy sled-pulling back to Sugar Moon farm, with only one quick bare pavement crossing. There were people everywhere – the parking lot was packed, the Sugar Shack was serving maple syrup on snow, groups were venturing out on the Rogart Mountain trail, and inside the tables were full and the maple syrup was flowing. We were lucky to get a table right in front of the roaring fireplace! Seven smiling faces… warmed by the fire and full of pancakes. Thanks once again, Sugar Moon Farm – we’ll definitely be back! I truly commend Heather and Wade for practicing LNT principles. When it comes to LNT principles in Nova Scotia, we are SO far behind the times, and collectively as a province, we need to pull up our socks. So thank you both for setting such fine examples when leading groups and practicing the LNT way. That being said, there’s a fine line between practicing LNT and being safe. For most of this hike, the temperature was between -20C and -26C. That’s really freakin’ cold for NS! On Day 2, we stopped hiking early and stood around until dusk with nothing to keep us warm besides our clothes. That night and the next morning, some of us were so cold our hands and feet ached painfully or we felt nothing at all until long after we started hiking. Had we carried a fire pan (such as a hub cap), we could’ve created a small LNT fire, thereby making the weekend safe for everyone and making it more enjoyable morale-wise. Granted, we were in a Wilderness Protected Area where fires aren’t permitted by law but safety always has to come first no matter where you are.